Welcome to Glasgow! Upon arrival, you will go through customs and immigration. Should you opt to purchase a transfer to your hotel; a representative will be waiting for you as you exit immigration. Arrive at your hotel, check in and do not give in to jet lag! There is so much for you to see and do! Start your sightseeing at the Gallery of Modern Art, which showcases works by contemporary artists and how the creation process influences their crafts. Afterwards, take a visit to two important buildings designed by Glasgow`s most famous historic figure, the architect and designer Charles Rennie Mackintosh. 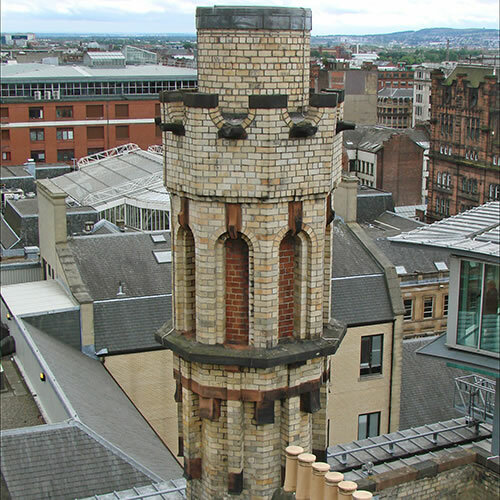 Number one: The Lighthouse currently houses Scotland`s Centre for Design and Architecture, and the exhibits promote Scotland`s contributions to both of those fields, just as Mackintosh excelled in them a century ago. 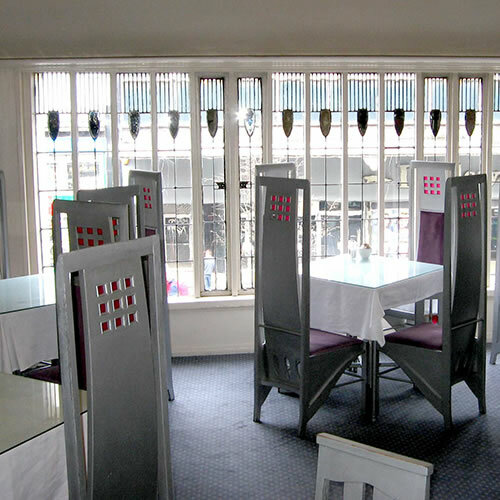 Number two: The Willow Tea Rooms were designed by Mackintosh in 1903, and after a thorough renovation, tourists can now sit for high tea in the same splendor Glaswegians enjoyed in the early 20th century. After tea, stroll around Merchant City, a neighborhood with lots of history. Partake in some shopping, followed by dinner, and immerse yourself in this hip and happening section of town. Start your day by window-shopping and picking up a light breakfast in Argyle Street, one of the big commercial centers in Glasgow. 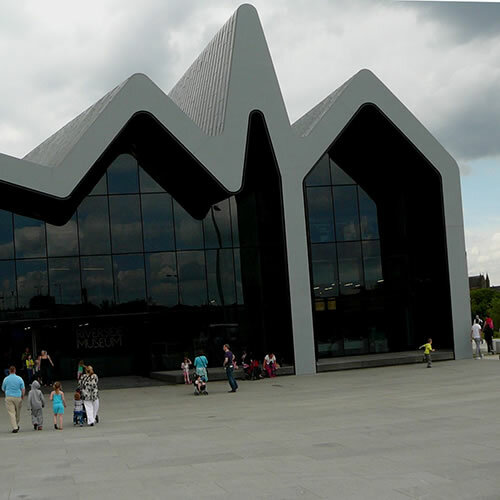 Then find your way to the Riverside Museum, which is the home of the city`s museum of transport. Be sure to stop by the Victorian-era tall ship anchored just outside the museum on the River Clyde. Then, enjoy the interactive science exhibits at the Glasgow Science Centre and take a trip up to the top of Glasgow Tower. 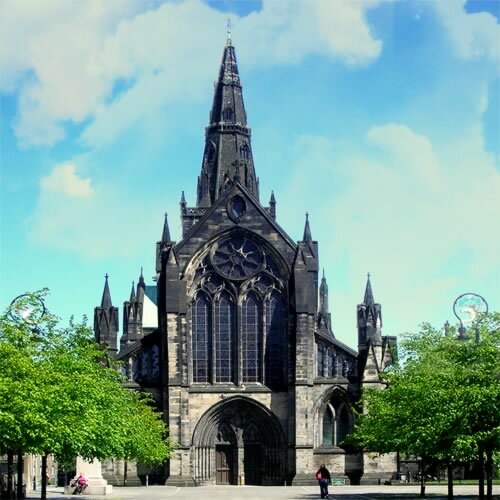 In the afternoon, travel to The Hunterian, a museum complex which includes The Hunterian Museum and Art Gallery, The Mackintosh House, The Zoology Museum and The Anatomy Museum, all on the University of Glasgow campus. Choose whichever museums are most interesting to you, although we recommend you visit at least The Hunterian Museum and Art Gallery as well as The Mackintosh House. 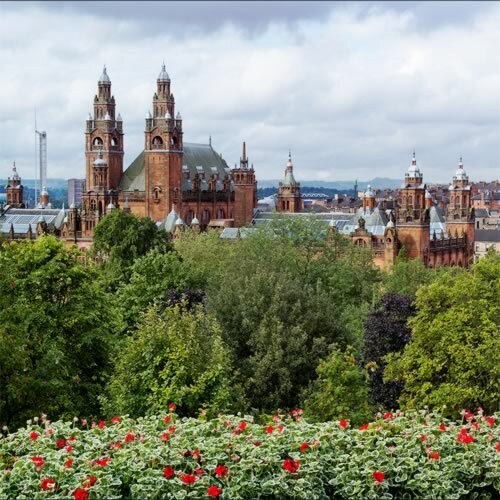 Afterwards, make your way to Kelvingrove Art Gallery and Museum, one of the most popular museums in all of Scotland, which features nearly 10,000 classic art works in its halls. Once you are done, the Glasgow Botanic Gardens will be calling your name, as will the glass-and-wrought-iron Kibble Palace, which houses exotic tree ferns not native to Great Britain. Finally, end your afternoon with a trip down Great Western Road, where both local and chain restaurants are located, and recharge your batteries while stopping for food. 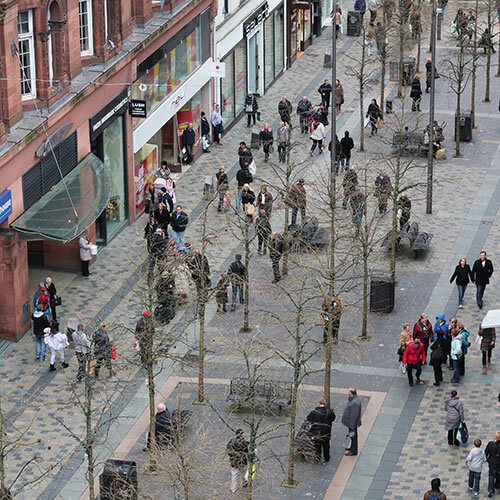 Four blocks away from the point in the city center where Great Western Road turns into Graham Street, you will find Sauchiehall Street, which is a popular place for shopping during the day and listening to the hottest live bands in Glasgow at night. Begin the day at the National Piping Centre, the most comprehensive museum dedicated to the Great Highland Bagpipe, one of Scotland`s many gifts to the world. Then visit the glamorous Glasgow Royal Concert Hall. Take a break at George Square, a public gathering place which is considered the center of town. 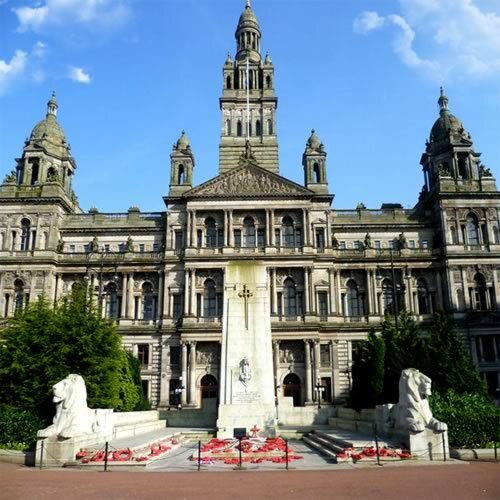 While you are there, take a look around the ornately-designed Glasgow City Chambers. Three of Glasgow`s must-see sights are within close proximity of each other: Provand`s Lordship, restored to 18th century decor, is one of the few Medieval buildings left standing in the city. Another Medieval building close by is Glasgow Cathedral, built in the 1100s and first restored as early as the 16th century. If you are looking for inner tranquility, visit the St. Mungo Museum of Religious Life and Art, learn about the world's religions, and relax in Britain`s first Zen garden (built with the museum in 1989). 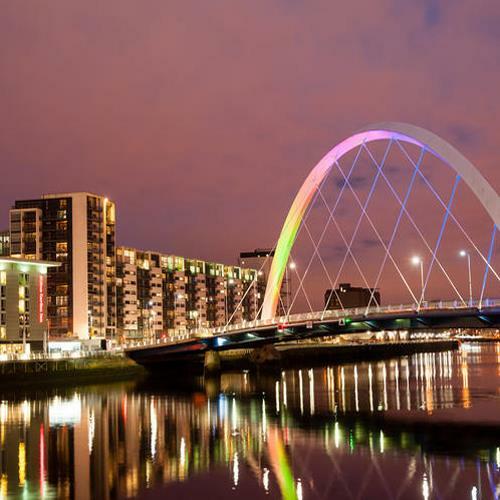 Move south of the River Clyde to House for an Art Lover. This Mackintosh-designed house, circa 1901, was never built in his lifetime. It was only fully realized in 1989 when a seven-year construction began at the hands of visionary engineer Graham Roxburgh. 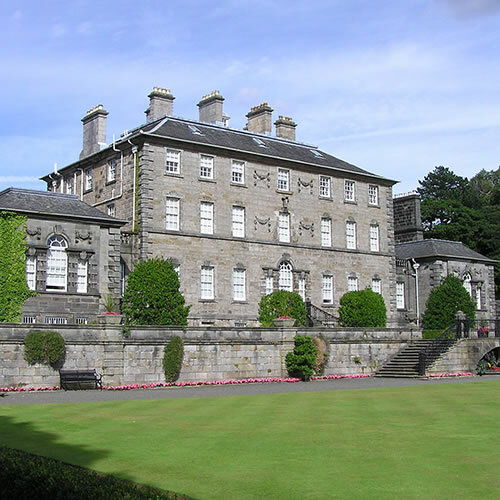 Take a step back into Edwardian luxury when visiting the nearby Pollok House and Garden, the longtime homestead of the Maxwell family. End the day enjoying the open spaces of Glasgow Green. 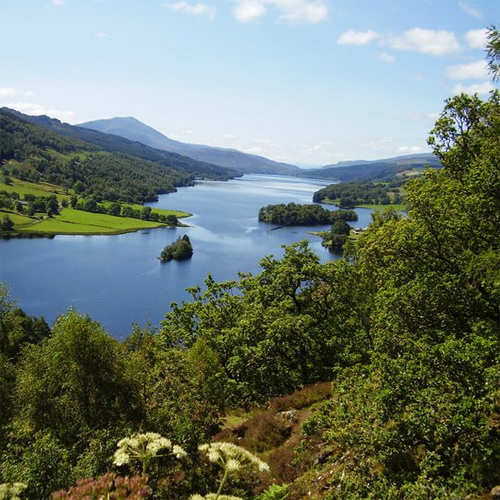 Enjoy the great outdoors by planning a day trip to Loch Lomond, approximately 33 miles away from Glasgow city center. View aquatic creatures in beautiful sea habitats at the Loch Lomond Sea Life Aquarium, and then take in the picturesque Loch Lomond and The Trossachs National Park. The park is full of secluded waterfalls, beautiful walking trails, and the largest patch of `dark sky` in Europe, allowing for crystal-clear stargazing free from urban light pollution. Just 45 miles to the east is Scotland's second city, Edinburgh, located on the majestic Firth of Forth. Edinburgh is a city that has long been a beacon of hope for the Scottish people, having first seated a government there in the 15th century. Today it is home to the Scottish Parliament, as well as the National Museum of Scotland, the National Library of Scotland and the Scottish National Gallery. Scotland`s booming nightlife and culinary scenes come together in the Old Town, where foodies can find five-star food and drink. Scotland is the birthplace of golf, and over 90 golf courses are located within an hour`s drive of Glasgow alone. 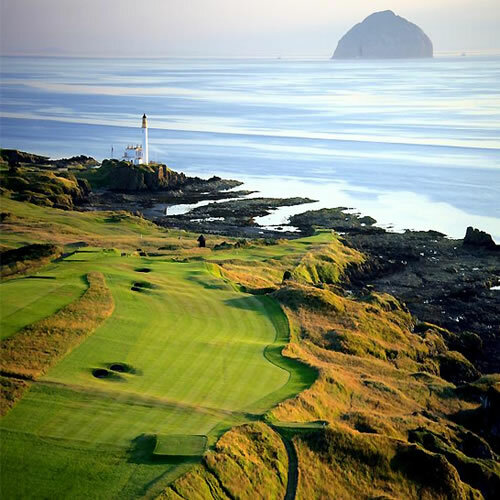 Southwest of Glasgow is the region of Ayrshire, which boasts nearly two dozen golf courses. Many of them are well-known worldwide, including Turnberry and Royal Troon, which have both hosted the British Open golf championship, and Prestwick Golf Club, which started the British Open tradition in 1860. Consider arriving during Ayr Golf Week, in early June. Depart your hotel for the airport for your return home. We recommend that you purchase a private transfer; if so, a representative will meet you at the hotel in time to take you to the airport for your flight out.